Hunter & Lomison is proud to offer the Generac Model 7035 16 kW Home Standby Generator with aluminum enclosure and we welcome the opportunity to familiarize you with this quiet, efficient, and reliable Guardian. Aluminum enclosure is structurally sound in winds up to 150 MPH and contributes to the very low noise level of the generator. Aluminum doesn’t rust and is ideal for locations near salt water. The enclosure is powder coated rather than painted. Some of the advantages of powder coating are a very hard, uniform finish that is approximately twice as thick as a conventional paint finish; great resistance to damage such as scratching and abrasions from vibration or bending; and powder coating is environmentally-friendly, as the process uses organic materials, application does not release harmful chemicals, and there is virtually zero waste of the coating material. Enclosure is sound-attenuated. The sound measures a low 66 dB(A) at (the industry standard) 23 feet from the front of the unit while operating under normal load. Enclosure is secured to a composite mounting pad which eliminates the need for a concrete base unless mandated by local codes. GFCI Duplex Outlet allows you to plug items directly in to the unit. Hood is hinged at the rear and, when open, the front panel easily lifts out, granting exceptional access for servicing. 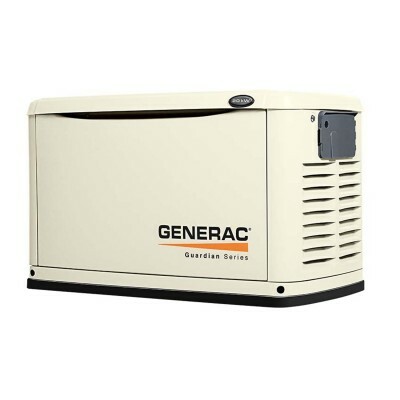 992 cc Generac OHVi (Overhead Valve Industrial) engine is specifically designed and engineered for powering a generator and manufactured to be durable, efficient, and quiet. Up to 50% reduced noise and 25% increased efficiency compared to competitors. Aluminum block with cast iron cylinder liners for durability. The cylinder liners are plateau honed, which allows for a quick break-in time, decreased piston wear, and low oil consumption. The liners are of the “Spiny-lok” type, which means that the outer surface is irregular rather than smooth so that it bonds securely to the aluminum block, increasing rigidity, and maximizing surface area for exceptional thermal transfer (it runs cooler). Both of these features increase efficiency and durability. Plasma-moly treated piston rings offer excellent oil carrying capacity, swift break-in time, and have approximately double the service life of ordinary rings. Full pressure lubrication system ensures that oil is quickly and uniformly distributed through the engine so that it is ready to safely produce power in about 5 seconds. Automotive style premium oil filter. Low oil pressure shutdown protects the engine from operating in a situation where the oil level is either too low or the oil has degraded to the point that it can no longer provide the necessary lubrication. Automatic decompression for quick and easy starts. Easily converts from natural gas to propane or vice versa in the fields (no tools required!). Quiet Test feature exercises the generator at a lower than normal operating speed; the sound and the fuel consumption are greatly reduced during exercise. Controller integrates many functions – such as electronic governing, voltage regulation, smart battery charging, exercising, and system status readings – that were once handled by individual components. Incorporates an intuitive user interface with 3 LED-lit status buttons for Auto, Manual, and Off, and then a simple “arrows, enter, & escape” system for all other functions. There is a menu hierarchy chart in the owner’s manual for convenient perusal. 2 Line Multilingual LCD Display is not just for menu navigation but also displays history, maintenance, and event logs for the most recent 50 occurrences. For instance, if you’re unsure whether your generator exercised last week or if it ran because of an outage while you were on vacation, there’s no more guesswork involved; you can read it on the display. 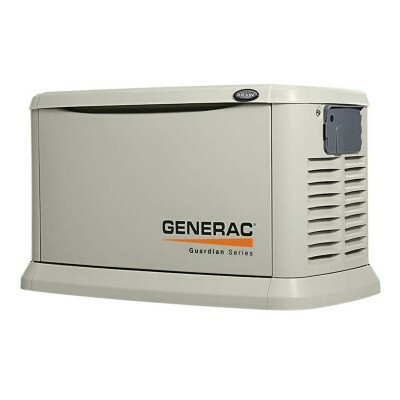 Equipped with a USB port so that your Generac technician can update firmware as needed. Constantly monitors both utility voltage and generator voltage to ensure that your sensitive electronically controlled equipment is getting “clean” electricity. “Clean” electricity indicates a nearly uniform sine wave; there is negligible voltage fluctuation at + or – 1%. Higher voltage fluctuation can cause sensitive items to run poorly or even sustain damage. Programmable Exercise function allows you to set the day and time of the week when the exercise occurs and also choose the frequency of exercise from weekly, to bi-weekly, to monthly. Exercise is important for your generator as it not only keeps your unit in ready-to-go shape for when an outage occurs but also acts as a test to confirm all is well with the unit. Need a replacement controller? We carry the 0j8371c Generac Controller in stock! 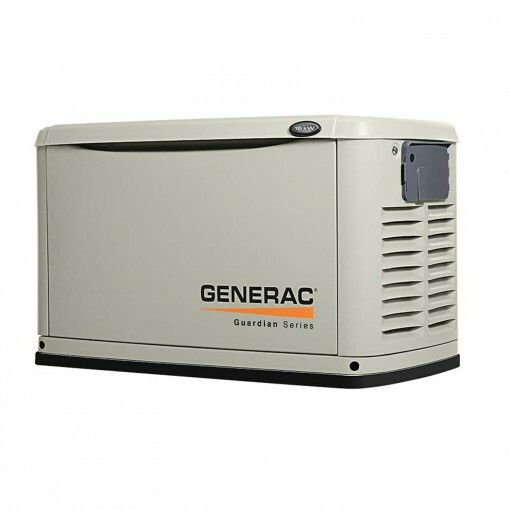 Electronic governor and Generac’s True Power Electrical Technology matches the engine control to changing load demands (such as a well pump or air conditioning unit starting) to maintain a steady 60 Hz.